Frost & Sullivan’s Best Practices Awards recognize companies throughout a range of regional and global markets for superior leadership, technological innovation, customer service, and strategic product development. 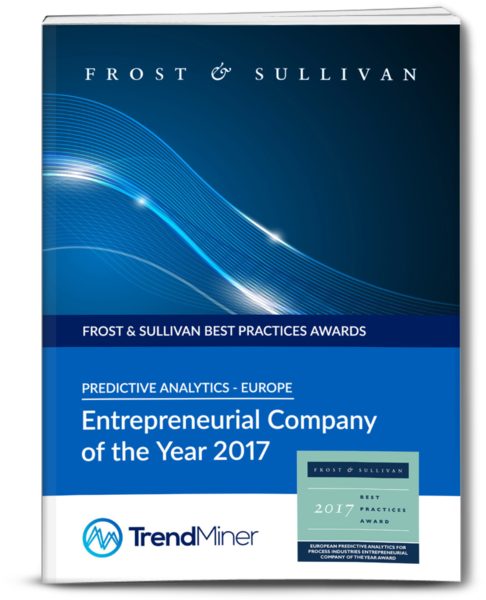 Frost & Sullivan has now confirmed that TrendMiner is the winner of the Frost & Sullivan Entrepreneurial Company of the Year Award 2017 in the category of Predictive Analytics. And why Frost & Sullivan considers TrendMiner to be an innovative market disruptor. Discover the three levels of sustained engagement TrendMiner offers customers, from deployment, through collaboration and quantifying business return, to tracking usage and providing value-enhancing guidance. Read why TrendMiner’s analytics software delivers such high price-performance value, how it delivers a quick return, sustained value, and why it is on the radar of high impact business intelligence applications. Frost & Sullivan is a business consulting firm that enables clients to accelerate growth and achieve best-in-class positions in growth, innovation and leadership. Frost & Sullivan’s industry analyst team benchmarks market participants and measures their performance through independent, primary interviews, and secondary industry research in order to evaluate and identify best practices. Frost & Sullivan’s intent is to help drive innovation, excellence and a positive change in the global economy by recognizing best-in-class products, companies and individuals.